Grab a Pig is the perfect game for lovers of farm animals; also it is 100% unique thanks to the beautifully designed game cards, individually produced plastic Portia Pigs and absorbing game play. Grab a Pig can be taken anywhere so makes the ideal farming game for travellers. If you or your children love farm games, you are sure to love Grab a Pig. Aimed at 6 to 96 year olds one young lady aged only 5 told the Good Toy Guide that Grab a Pig is “The best game ever”. 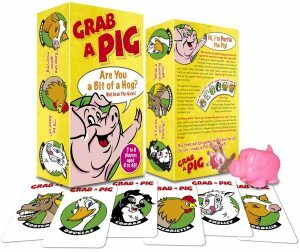 The most popular farm animals feature in the Grab a Pig card game; so lovers of farming games will want to take this perfectly portable game on holiday with them wherever they go. Forget online farming games like the Farmville game; instead of tying yourself or your children to the computer you can be social. Grab a Pig will bring you all together as a family for absolute riotous party fun. Whether it’s Christmas, a holiday, a birthday or just any old day throughout the year Grab a Pig will get things going. The main cast of the Grab a Pig card game are Conrad the Collie, Shelley the Sheep, Hortensia the Horse, Henrietta the Hen, Douglas the Duck and Cordelia the Cow. They are all unique in their personalities and make the best of farm friends. Portia the Pig is the one who keeps them all together and she is the main character in the game. If you want a farming game that is excellent value, for your child or yourself, then the Grab a Pig card game is perfect. Compact and portable, Grab a Pig is the perfect accompaniment to any holiday it is small and light making the perfect travel game to take on any journey. We want Grab a Pig to be a game that is enjoyed by people from all walks of life for years to come. It would be lovely to see it still being played with decades from now. Lovers of animal games, pig games and farming games should find something to enjoy about Grab a Pig.